Reba and I had a fantastic Father’s Day. 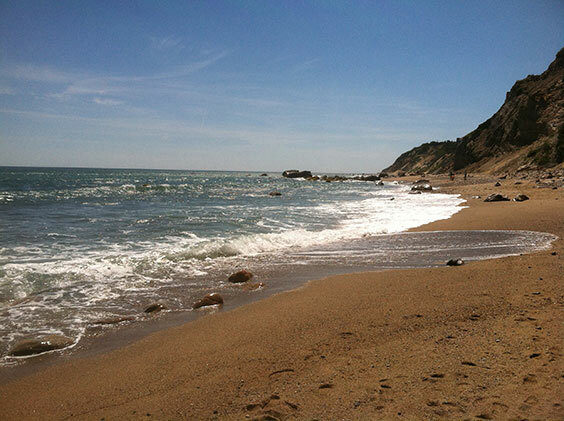 On the spur of the moment we decided to go to Block Island, Rhode Island on the day itself and spend the night at the Manisses Inn. 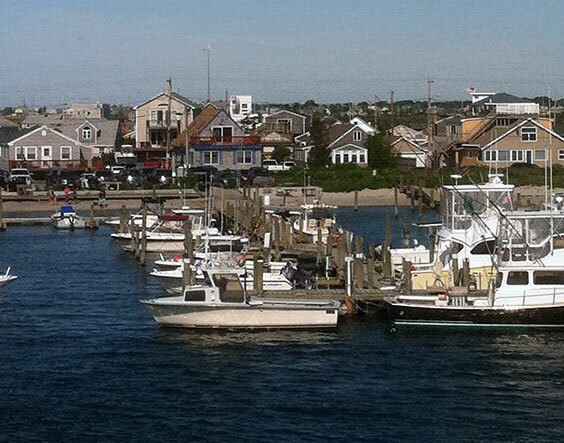 We drove 2 and ½ hours to Point Judith Rhode Island and took the ferry across to Block Island, a 55-minute trip. Of course, we barely made the ferry. It seems no matter how well we plan, we are always rushing places. Which reminds me of my book. The hero, Gregory, really falls in love with the Amish way of life and one of the things he loves about it is the slower pace of life and the sense that it doesn’t seem so man things have to be done “on time.” As with Reba, it just goes to show how easily one can lose that worldview when you “leave the farm” and take up a non-traditional way of life—just as Rebecca contemplates doing in my novel. That’s why I can’t wait to get back for our next visit to the farm in Lancaster County. 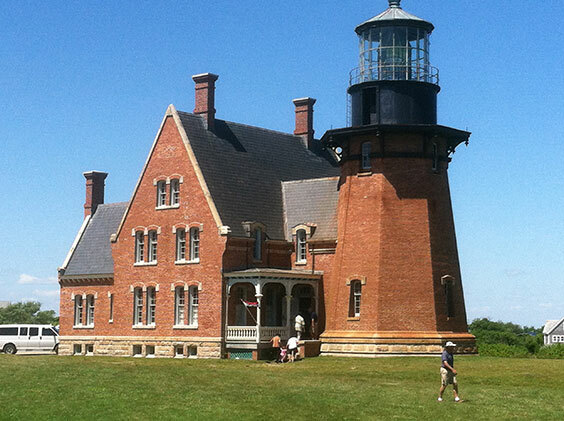 But, as you can see in this picture of Point Judith harbor, coastal New England isn’t a bad substitute for beautiful Lancaster. The first thing we did after we checked in was to go to this beautiful church that sits on top of the hill near our inn. We were a little late and the Reverend Steve Holloway had already begun his sermon. It was a wonderful sermon entitled “Who’s Missing in this Picture?” The “person” missing is the Holy Spirit. Steve talked about how most of us think of the heavenly hierarchy as God on top and Jesus underneath and the two of them somehow connected. Christians worship the Trinity, yet the Holy Ghost is often missing from our thoughts about God and Jesus. Steve reminded us, however, that the very first chapter of Genesis talks about the “spirit of God” moving over the earth. The Holy Spirit is there from the beginning. He went on to say the Sprit is that force within us that feels like “love.” God is Love, as we teach our children from their birth. He had many other wonderful things to say about how pervasive is God’s love, but my favorite was when he quoted Elvis Presley, of all people, and his song “A Hunka Hunka Burning Love.” That’s what he said God is, a hunk of burning love. What a wonderful image! And how I appreciate a minister who can introduce a bit of humor into his sermon. The rest of Father’s Day Sunday we spent experiencing God’s burning love. Everywhere we went there was the beauty of God’s creation, as you can see in this picture of the beach at Mohegan Bluffs and this rose bush we saw along the way. 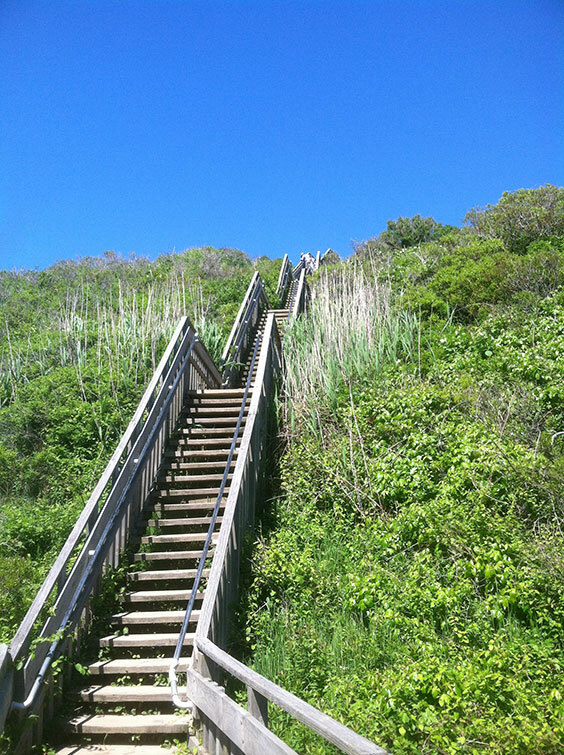 You can also see the 150-stepped stairway we had to descend to reach the beach! It was amazing to think that the houses perched on top of the bluff won’t be there in another century thanks to erosion. 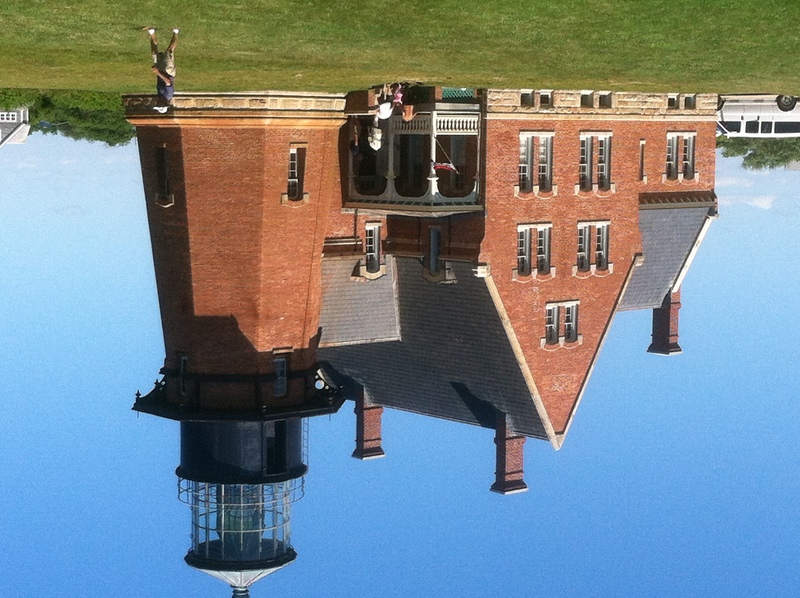 That would have happened to this beautiful Victorian lighthouse if not for the far-sightedness of the citizens of Block Island and the U.S. Government. When they saw that the edge of the bluff was a mere 50 feet from the building, they moved the building to the site you see here. The guide said it would last in that spot another 100+ years, and then they’d have to move it again. All of which caused me to reflect on the impermanence of man’s creations within the permanence of God’s. Reba and my room had a small porch just down the hall, which we had all to ourselves. 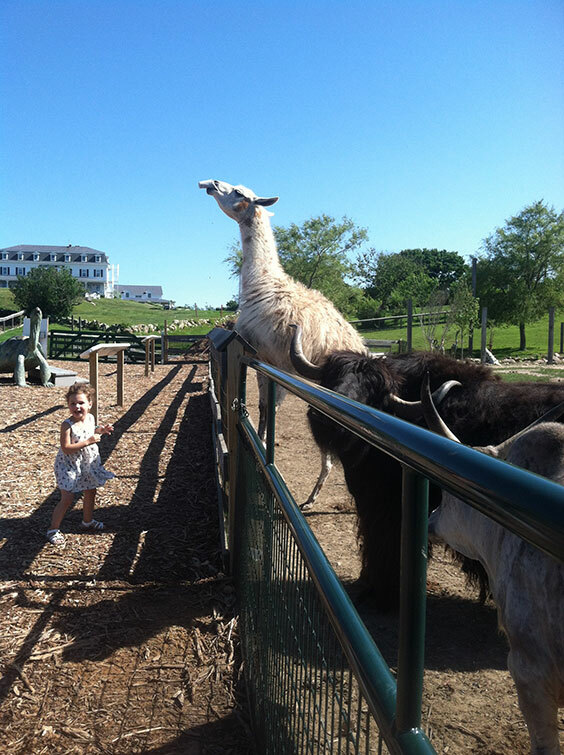 It looked back onto a farm with various exotic animals like a yak, a huge turtle, a giant rabbit, and a llama. That’s the llama drinking down a whole cup of feed! 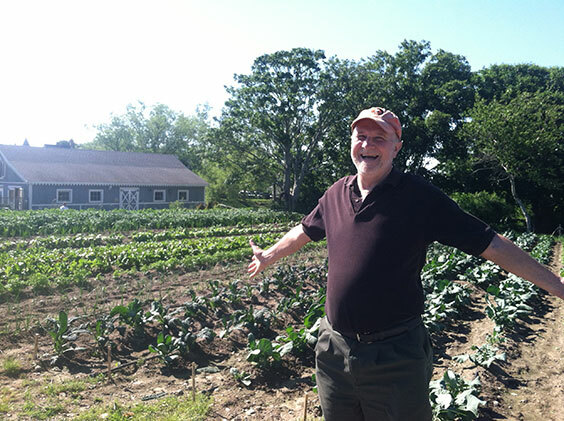 And that’s me in front of my garden—I wish! We went to bed early and slept the best sleep we’d had in months. 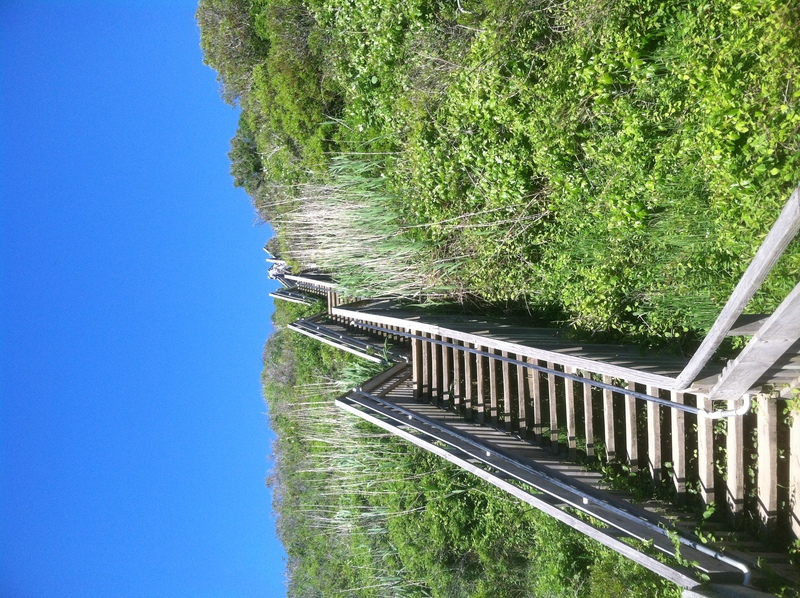 All that hiking! Well, and maybe a few too many burgers. 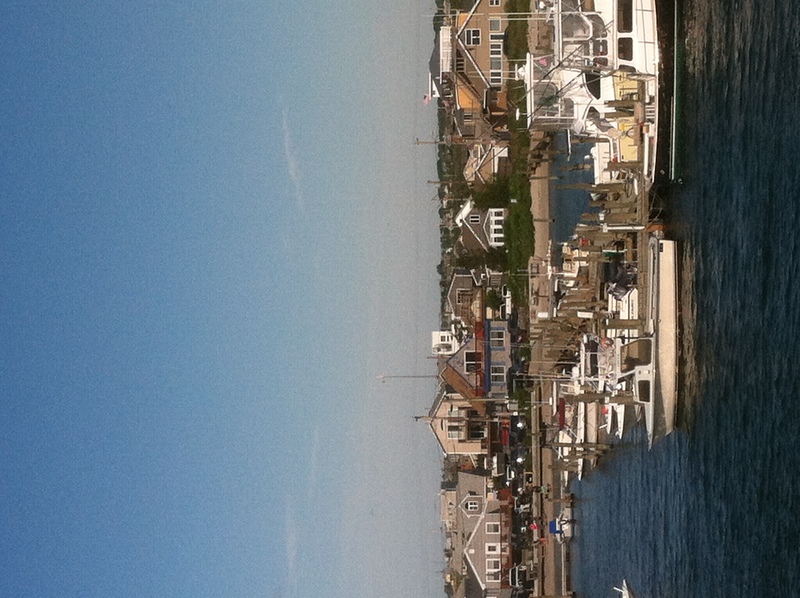 The next day was just as beautiful and we stayed as long as we could until “reality” called us back to shore. But there is nothing like being on an island in the middle of the ocean to give you some wonderful perspective on life and remind you of all the beauty and love that surrounds you all the time, if you can only stop to see it. 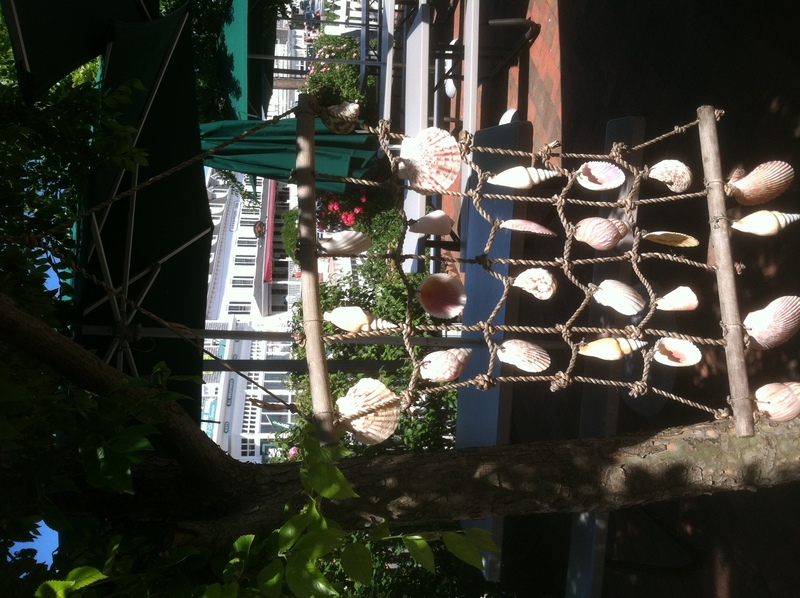 Speaking of which, Reba loved this way of arranging seashells (which she collects wherever we go—our house is “swimming” in them!. 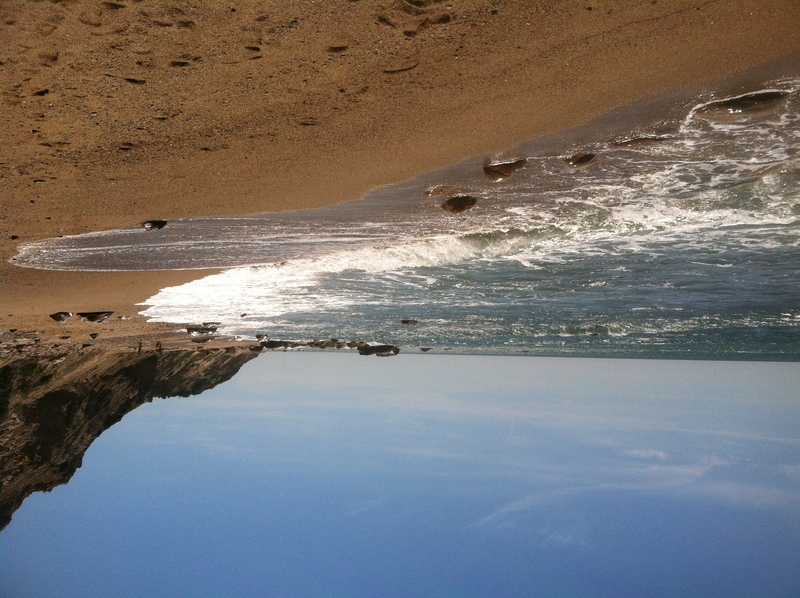 I share it with you as something you might like to create yourself. Or just enjoy as another example of what we can do with the beautiful gifts God gives us. I hope you and yours had a wonderful Father’s Day, too! I am happy to share with you the publication of my first novel by launching the official “CRICK” blog! I’ll use this space for occasional pictures and observations not only about my novel and the Amish life that inspired it, but also just about my life in general, as a way of creating a kind of “cyber-bond” with you. As part of that bond, please feel free to send me an email about the blog, but especially about the novel. I really would love to hear what you think about it—even the parts you may not have liked! After all, how can I improve as a writer if I don’t know what works and what doesn’t? I have decided to donate all my proceeds from the sale of Stone in the Crick to Lancaster charities. Yes, that’s right, not just a percentage of my sales but all of them. I gladly do this for several reasons. First of all, my wife, Reba, was raised Amish-Mennonite. 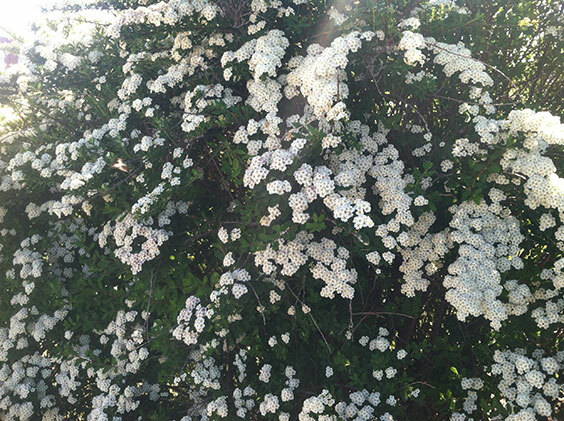 You will see many pictures of the beautiful farm where she grew up in future posts to this blog. Reba’s life inspired much of “Crick,” and several of the characters are based on friends and relatives I have met through my marriage. So I donate my profits to honor Reba. I also want to honor the Amish heritage she and others have shared with me. The Amish are truly an amazing people. Their love of family, their deep reverence for God, their profound respect for the land and for nature, and their strong sense of community are values and virtues I admire tremendously. I loved writing about them in “Crick” because I have loved learning about them. It is an honor for me to be able to show that love by sharing any income I derive from “Crick” with charities that support the Amish and their way of life. 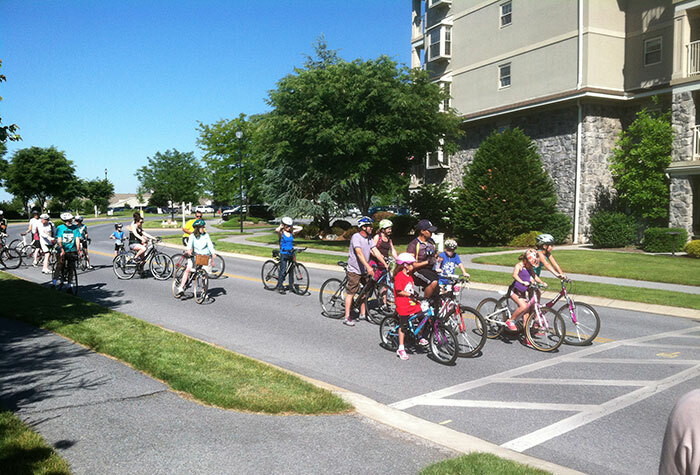 Here is a picture of a bike race, but it’s not just any ol’ bike race. 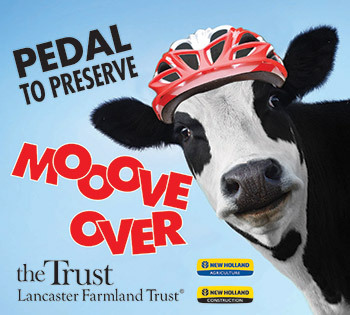 This is the Lancaster Farmland Trust’s annual fundraiser called “Pedal To Preserve.” What the Trust is preserving is some of the beautiful farmland in Lancaster County, Pennsylvania, and they are doing a good job of it, too. They have obtained easements on 428 farms that comprise over 26,000 acres. This is a non-competitive bike race where the riders choose to ride 6, 20, or 51 miles through the breath-taking Lancaster countryside. 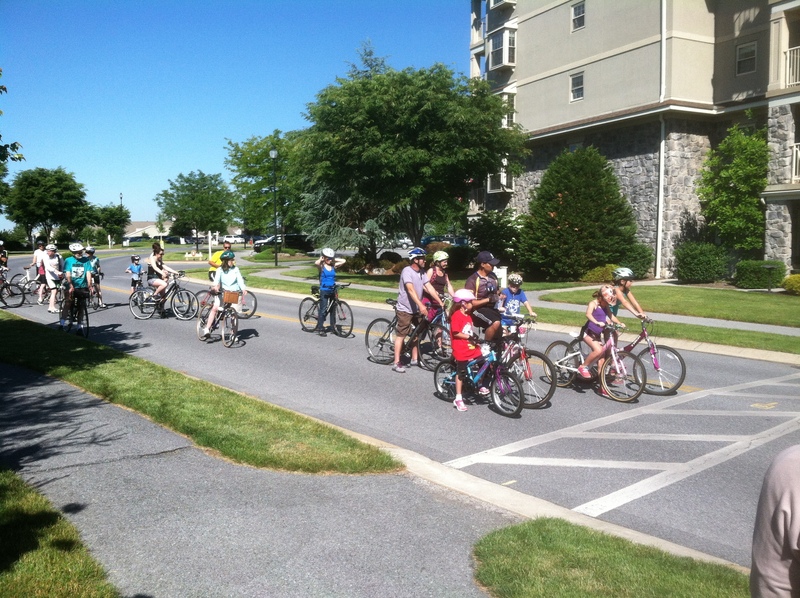 It’s a real family affair, with lots of children riding the 6 mile route. 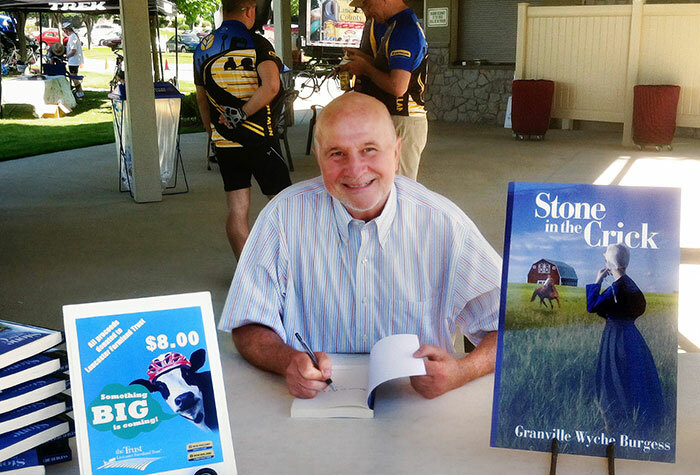 At the finish, everyone enjoys donated food and drink and some of them get an autographed copy of Stone in the Crick! That’s me at my very first book signing. If I look happy, it’s because I am! 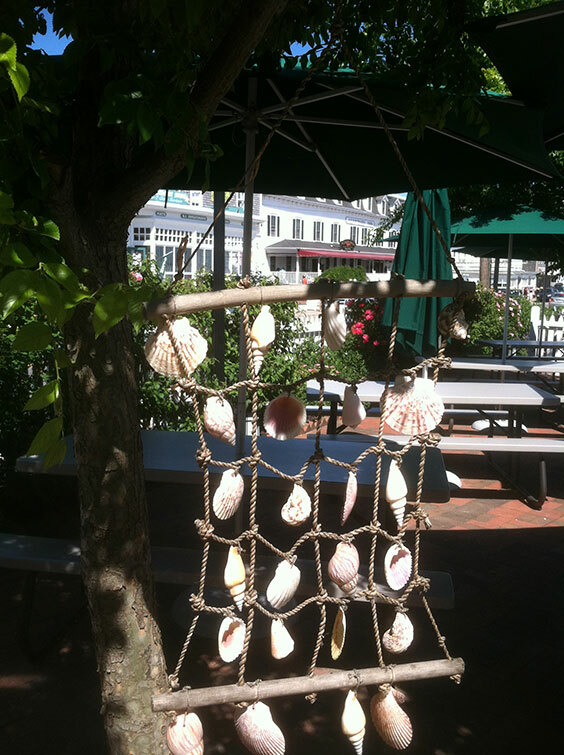 I loved writing little messages in the front and I loved handing over all my proceeds to the Trust. 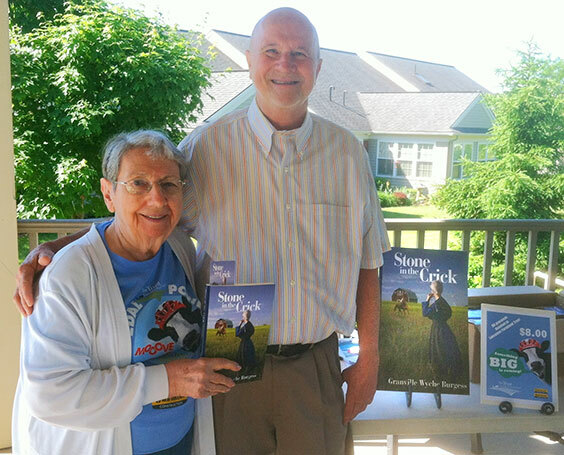 It didn’t hurt that it was a beautiful day, lots of sun, no humidity, a perfect day to launch my campaign of donating to Lancaster area charities to preserve the Amish heritage. 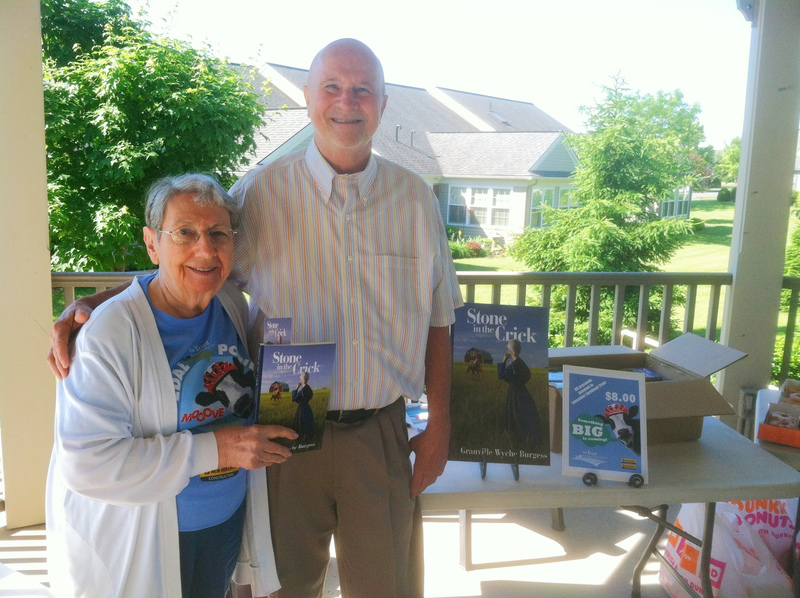 Here’s a picture of my very first customer at the Pedal to Preserve event, Mrs. Arlene Hartranft. At her request, I mailed her a copy and I hope she enjoys it as much as I do. When you buy the book, you’ll know that you, too, are contributing to the preservation of this great people, their unique and simple lifestyle, and the beautiful land on which they live. Thanks! 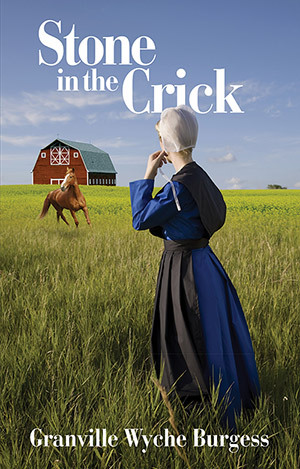 I look forward to continuing to share with you about my life and the life of the Amish I know and to hearing from you about what you think of my first novel, Stone in the Crick. 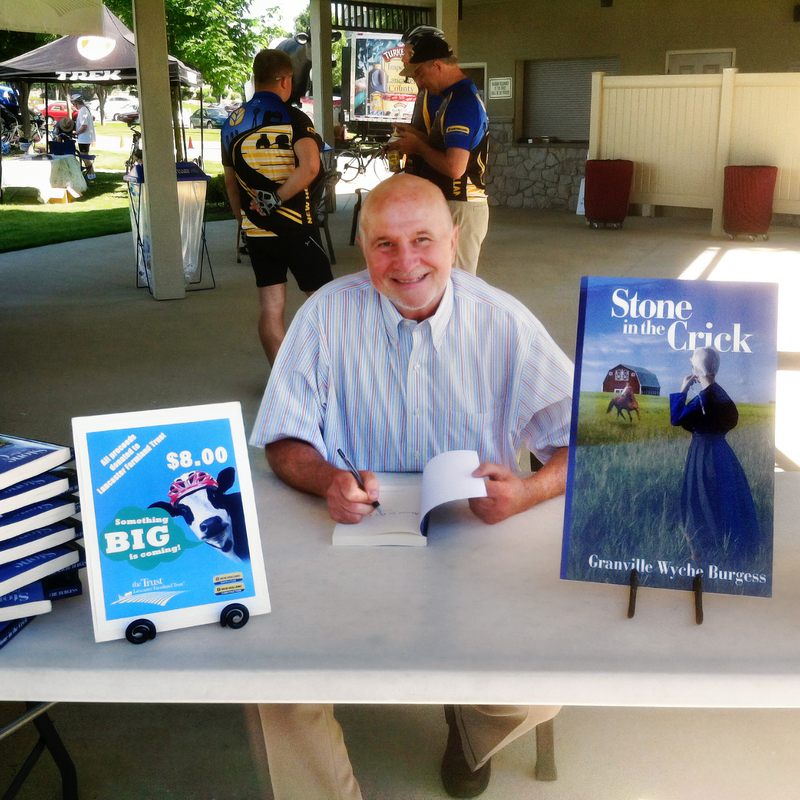 Granville donates all author proceeds to Lancaster Area Charities. Copyright © 2019 Granville Burgess.